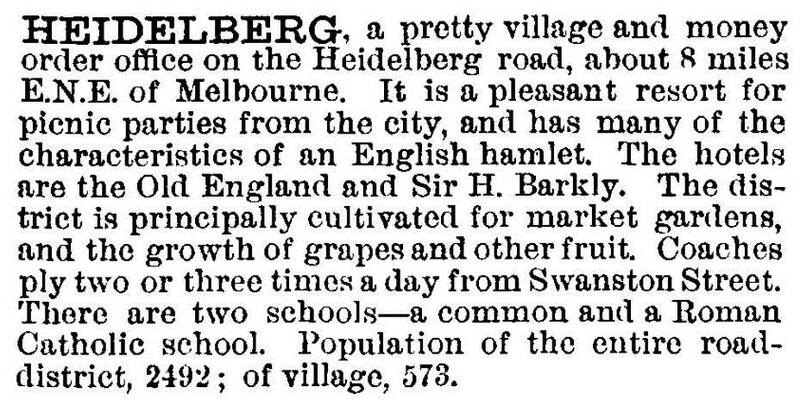 The suburb of Heidelberg, 2 km north-east of central Melbourne, began as a village named Waringal a few years after the foundation of Melbourne. Later, the township’s name was given to the surrounding municipality which extended from Fairfield to Doncaster. In September 1838, Port Phillip’s first sale of farm lands occurred in the Heidelberg district, and provision was made for a village immediately west of the Yarra River in the vicinity of Banksia and Darebin Streets. Named Waringal (thought to derive from an Aboriginal word meaning eagle’s nest), the village’s original elements are apparent in St John’s Anglican church (1849) in Burgundy Street, the Old England Hotel (1848) in Lower Heidelberg Road, the old court house in Jika Street, and the sites of the Catholic church (1859) and the primary school. Immediately north-east of the Waringal village Portion 6 of the 1838 land sale was owned by Richard (Continental) Browne. He named it Heidelberg, probably after the town in Germany, and popularised the name when he subdivided and sold the land in 1839-40. One of the four subdivided lots was acquired by Joseph Hawdon who built his Gothic Banyule mansion (1846) in Buckingham Drive overlooking the Yarra Valley’s Banyule flats. 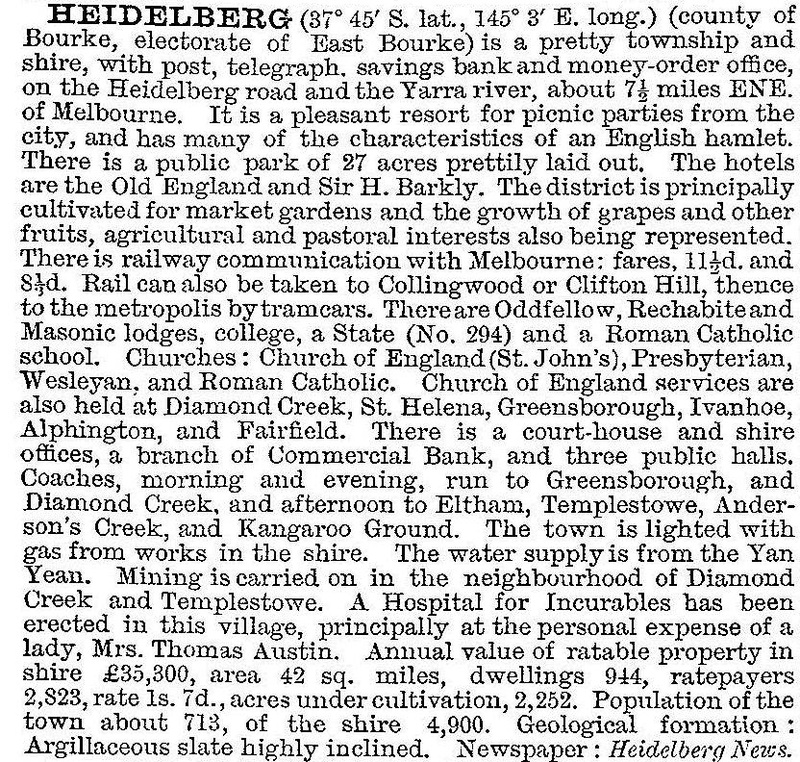 Heidelberg was reached by a track from Melbourne, crossing the Merri and Darebin Creeks and wending on past several prosperous farms. In 1841 local landowners formed the Heidelberg Road Trust for the road’s upkeep. It was Port Phillip’s first local government body. 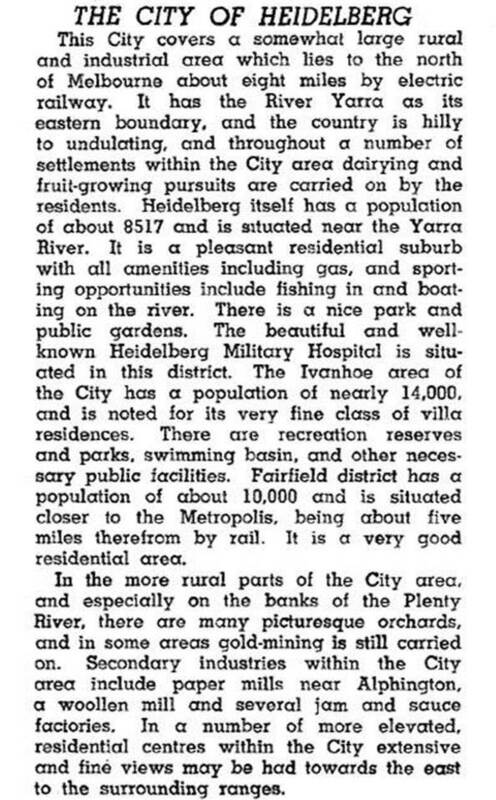 Within a few years Ivanhoe had overtaken Heidelberg, being described as a suburban township in contrast to Heidelberg’s dairying township (Victorian municipal directory, 1912). Beyond walking distance of the railway stations, the landscape was dotted with rural estates. Prominent examples were found in Eaglemont and at Charterisville near Burke Road and the Yarra valley. Both places were used by ‘Heidelberg School’ artists for plein air painting who, before then, had painted at Box Hill. The Yarra valley views were artistically impressive, and became a major selling point for interwar real estate sales. The 1933 census recorded 6423 dwellings in the shire, a fourfold increase since 1911. Most dwellings were free standing on large blocks of land, embracing Queen Anne, Californian bungalow and Mediterranean styles. Notable eclectic styles were Desbrowe Annear’s designs (Mount Eagle) and Burley Griffin’s knitlock houses. In 1936-39 A.V. Jennings built two early housing estates: Beaumont, in Melbourne Road behind the town hall and Beauview in East Ivanhoe. City status, however, did not alter the fact that the municipality had only one public transport line about 4 km from some places on its riverside boundaries. Ivanhoe West and Heidelberg West were dairying places until resumed by the Housing Commission in the early 1950s, and the latter estate was opened to accommodate athletes for the 1956 Olympic Games. In 1964 the area north of LaTrobe University and Yallambie was severed and became Diamond Valley shire. Two years before, the area west of the Darebin Creek was transferred to Northcote city. By the 1970s Heidelberg city’s residential development was nearly complete except for parts of Viewbank (Rosanna East) and Yallambie. Shopping areas were mostly of the typical strip kind, but the small free standing centre in Bell Street, Heidelberg West (1956) is probably the first American style drive in centre in Australia. It was built to a Housing Commission design. LaTrobe College moved to a site in Waiora Road, Bundoora, in 2012 where Macleod Technical school opened in 1961. Heidelberg is a mature suburb, intersected by Bell/Banksia Streets, Lower Heidelberg Road and the railway line. The Austin Hospital is its dominant building. Its eastern flank is the Yarra Flats and Warringal wetlands. Since 2012 the hospital has housed the Olivia Newton-John Cancer Centre. The suburb encloses all of the old Waringal village, and a drive-in Waringal shopping centre (1987) is next to the State primary school (370 pupils, 2014). Shops continue westwards along Burgundy Street to the railway station. There is a Catholic primary school, but State secondary education is further afield in Viewbank, Heidelberg West and Heidelberg Heights. On 15 December 1994 most of Heidelberg city was united with most of Diamond Valley shire and part of Eltham shire to form Banyule city.